Day 22..Can you believe it? After today there are really only about 5 more days left in this challenge. Since I'm going to be gone a good portion of Friday, that means only 4 more days left for me. It's hard to believe how fast this month has zoomed by and how much work I've gotten done. Of course, it's hard to believe how much work there's still to do, you know? I can't wait though. At the end of this week, I get to see how all of you did and that's exciting for me. You guys have been my teammates, my partners and yes, my challengers. When I see what one of you has gotten accomplished, it's only pushed me to work harder. Thank you for that. Now, let me give you the update. This was taken from the doorway, looking in. 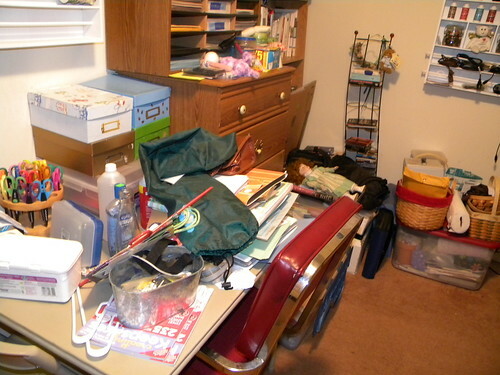 As you can see, there is still plenty of clutter on my tables. However, I do have my boards hung on the walls and my shelves up, as well. You can't see the shelves in this picture, though. Shoot! Now, the box on the floor is being filled up for freecycle. The trashcan is full of items that go up to the boys room. This is the arrangement that I put together on the lower shelf. 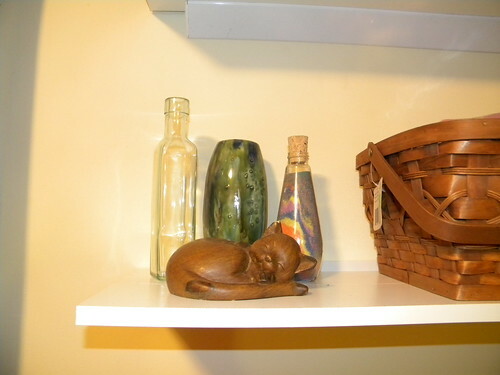 The bottle and vase were picked up at a thrift store in Buffalo. The sand bottle was a Mother's Day gift from Ben. I've very carefully moved that on the last two moves, praying that stopper didn't come out. The kitten..well, I plain don't remember where I picked her up at but she always looked so happy and content. I just love her. And this is the PC corner. 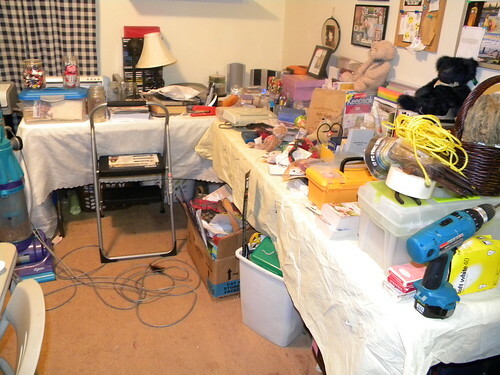 As you can see, I still have some items waiting to be gone through and put away. That poor desk is totally covered in things. 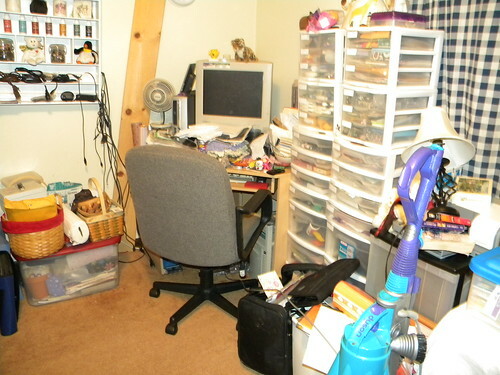 I've decided that my goal for Wednesday is to work in that corner and get it tidied up. Goals are good, right? And this is the boys crafting table. As you can see, I've started getting it put together. Each of the photo boxes has different crafting items in it. I still need to do labels for them, though. The clear box under those holds items that are too big for the photo boxes, such as their scrapbooks and such. The items in the corner are waiting for me to go back through them, again. So folks, that's my plan. I just have two more things I want to mention. 1) For Sale - One Flute - $350 or best offer. I have all of the details on this but on the other PC, of course. It's an Olds French Style Open Hole flute. It was used for about 2-3 years in high school band and college pep band. It's in great shape and comes with the cleaning rod and hard case. It originally retailed for $880. If you know of anyone, please have them get in touch with me. I will ship this if need be. 2) Your challenge - For some of you this one will be quick and easy. I want you to walk around your home and take a look at your knickknacks and all of the little items we seem to find on our shelves. You know, those things we grumble about when it's time to dust. Yep, now you know just what I'm talking about, don't you? Do you love them? Are you holding onto some of them for purely sentimental reasons even though it's really not you? Well, today I want you to let go of any of those that you don't love. If you're keeping it for sentimental reasons, take a few pictures of the item. That way, you still have something to trigger the happy memories, but it's taking up far less space! I'm off to grab something to eat and then back into the wall, I go! I will be back in Twitter and such today, so feel free to tweet at me and to retweet. I'm still working on my goal of 30 followers here, so your Tweets can only help! you are doing such great work! I gave up on my basement weeks ago :) I guess things came up, and I was busy with other projects! I'm excited to see how yours turns out!